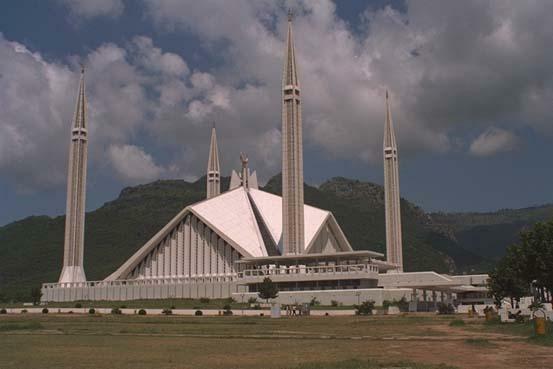 At the foothills of the Margalla Hills in Pakistan's capital of Islamabad, the Shah Faisal Mosque is one of the core places of Muslim worship in Southern Asia. This mosque was designed by a renowned Turkish Architect, Vedat Dalokay and named after the late King Faisal of Saudi Arabia. It is spread over 1,89,705 sq.metres with 88 meters high minarets and 40 meters high main prayer hall. The main prayer hall can accommodate 10,000 persons while the covered porticos and verandahs can take over 24,000 worshipers. The main courtyard has space for 40,000 people.